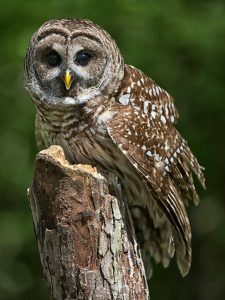 Willow | Meet The Ambassador | RAPTOR Inc.
Spencer: Barred Owls are common in suburban area and often quite vocal, even during the day. They can be identified by their typical hoot which sounds like the mnemonic “Who cooks for you?” Spencer is 21 inches tall, weighs 1.5. lbs. and has a 3 foot wingspan. He came to RAPTOR Inc. in November, 2014 after being transferred from the Medina Raptor Center. He was rescued as an adult with a blind right eye. With compromised vision and hearing, Spencer is unable to be released back into the wild.